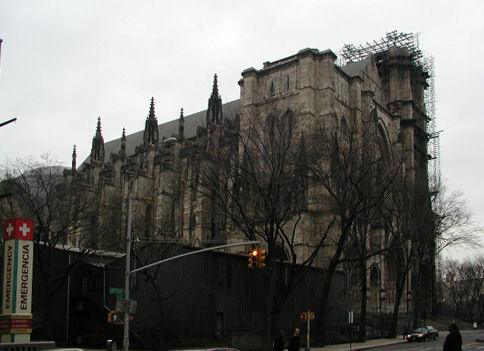 The Cathedral of St. John the Divine is the Mother Church of the Episcopal Diocese of New York and the seat of its Bishop. According to the Guinness Book of World's Records it is the largest cathedral in the world - neither St Peter's in Rome nor Notre-Dame de la Paix in Yamoussoukro, both are significantly larger than St. John the Divine — are cathedrals. Construction on the cathedral was begun with the laying of the corner-stone on December 27, 1892, St. John's Day. The first services (in the crypt, under the crossing) were held in 1899. In 1911, the choir and the crossing were opened. The first stone of the nave was laid and the west front was undertaken in 1925. The first services in the nave were held the day before the bombing of Pearl Harbor. The crossing was to be surmounted by a vast crowning spire that has yet to be built. Until then, the crossing is sealed with a "temporary" dome of Guastavino tile finished in 1905. The scaffolding around the unfinished spire can be seen in the photo. Info from Wikipedia. Thanks to Rob Williams, Vancouver, BC, Canada, for guiding me to the cathedral.